Vivian Birdsall, STEM teacher at Saxe Middle School. Taken Nov. 12. 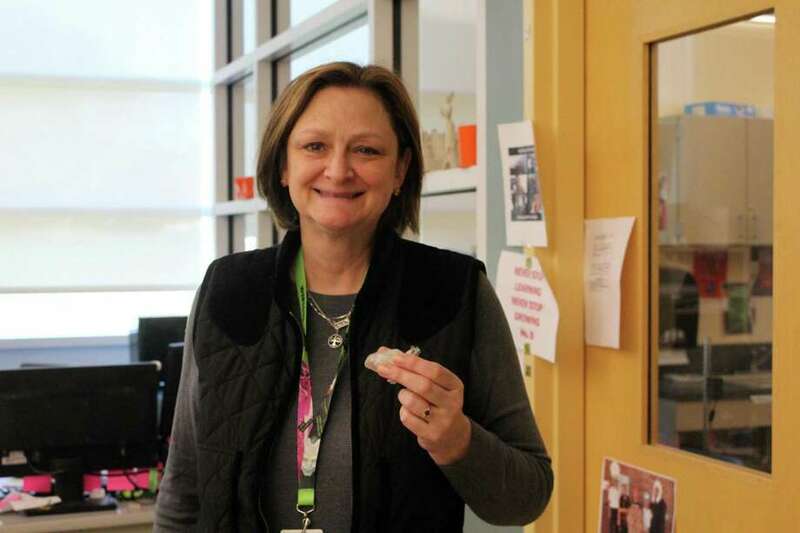 NEW CANAAN — Since joining Saxe Middle School 19 years ago Vivian Birdsall has helped to start a Science Technology Engineering and Mathematics (STEM) program. Though she has been a teacher for over 19 years, her love for STEM originated from a career long before she became a teacher. The Southbury resident originally worked for a company called People Express. Shortly after her company was bought out she decided to make a career change. “I decided I didn’t want that kind of lifesyle so I went into teaching,” Birdsall said. Her time as a flight instructor led to her decision to become a teacher. 15 years ago Birdsall became the math instructional leader at Saxe Middle School. Despite the change in jobs she still wanted to teach students. “I had no kids during the day because I was working with adults as a coach and coordinator,” she said. Her passion to teach and love of technology led her to start an afterschool club. Originally it started as a small gathering in the library for kids interested in technology. First the four kids wanted to simply build websites. The following year the kids wanted to build a computer and the year after that the kids built one of the first 3D maker bot kits. In the STEM class at Saxe Middle School she teaches a variety of things. This includes Vex Robotics where students can design, build and code a robot. She also teaches Autodesk Inventor, a 3D modeling program, and MIT Apps Inventor, a program for students to learn to code apps for Android devices. Birdsall said the learning curve has been huge with technology rapidly changing since she came to the school 19 years ago. Over the years she has grown with her students as technology evolves. Students have made robots out of kits and even made charging units for phones. As it became easier to code The support of the middle school and the community has allowed the program to blossom over the years, she said. Over the years she has learned with her students and works with experts in fields she may not be knowledgeable in. For example, one parent who was a scientist came to the class and showed students how to make Hydrogen out of water. Using a solar panel he showed students how to power a motor. Over the years as technology has evolved and the STEM program has grown the capabilities of the class has increased. Birdsall recently asked for a grant so students can experiment with virtual reality. Students will have the opportunity to program Microsoft Hololens for virtual reality.